Wild Fig is Justin Maule and Nicola Maule and a team of wonderful staff. A catering company based in the west of Scotland committed to sourcing the very best Scottish produce from the land and sea, delivering a high-quality product at events and tables around the country. Just as a business is a story within the lives of the people who work there, there is a journey made to reach that beginning, enriching its purpose and with a passion that keeps it flowing onwards. Making short films, documenting through the magic of darkrooms, absorbed in working with local Glasgow bands before further years of studying film and history of art – all the while serving the public in restaurants and bars in Glasgow’s city centre. Nicola moved from this to the world of fine art curation, writing and researching object d’art and the lives surrounding the consciously depicted and the artist themselves. This gave way to a beautiful pause and nearly 10 years of fully dedicating her time and energy to growing and nourishing 3 wonderful individuals. With a strong wish to work more creatively around their needs and when the time was right, a family business was born, one where as husband and wife Justin and Nicola could pull on their skills and experiences, while continuing to support and nourish their family. We had a fantastic team build event at Loch End Chalets and Justin kept us all fed and entertained throughout. On arrival, we were greeted with a wonderful lunch which set us up for the rest of the day and was a great glimpse into what to expect for dinner. Following an informative and fun gin tasting our 4 course dinner was relaxed but there was nothing relaxed about the quality of the food all of which was produced from a small standard kitchen and every ingredient tasted fantastic. The miso salmon was unanimously agreed to be the best salmon any of us had ever eaten – which is quite a feat for a salmon company. Worked as a chef in kitchens large and small since leaving school, punctuated with a love of skateboarding, which saw him travel to competitions throughout Europe and naturally led onto a love of snowboarding – it’s easier on the knees! Yet cooking was undoubtedly the backdrop to his early life as he travelled around the great restaurants and hotels of the Continent with his father, receiving an early education in fine food. 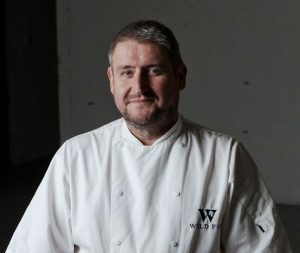 His father, who was himself a chef of reputed standing – Charmain of the Cookery and Food Association, Chairman of Judges for the Salon Culinaire and Craft Guild of Chefs – William Maule naturally passed on his knowledge, skills and techniques in the home that served ultimately as the grounding of Justin’s talents as a chef. Years later Justin worked in his father’s restaurant from the ground up, further developing his skills before going on to work in some of the best kitchens in Scotland. His training was classic French cooking and he has impressed food critics such as The Herald’s Ron McKenna who described his cooking as ‘excellent’. Self-development has also been a key element throughout his career – much of what Justin has learned as come from his own investigation and motivation and this continually shows in the exceptional standard of his cooking. Even the humble bowl of porridge was given a rave review by one food blogger, just one course in a recent Wild Fig pop-up brunch event, ‘you have ruined porridge forever because your porridge was so nice, we won’t want it from anywhere else’. Today, Justin continues to work with ingredients that Scotland so richly offers while also consciously embracing the diversity of sourcing globally, allowing national cuisines to influence and inspire in his flavouring. Interested in our work? Let’s chat!